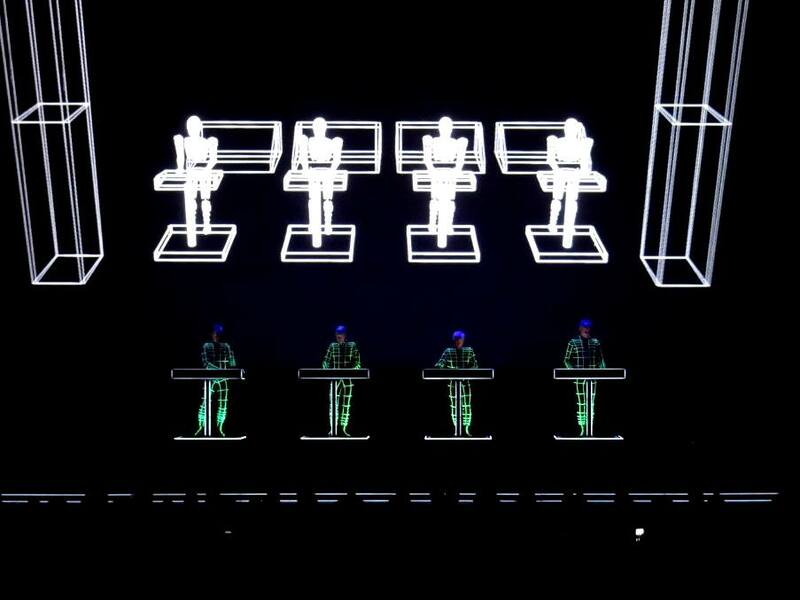 After the ticketing debacle of the London Tate Modern Turbine Hall shows in 2013, the announcement of what is a pretty extensive tour for KRAFTWERK has now at least given fans of Die Mensch Machine a fighting chance to actually see them live. The Electricity Club was present at the middle of a trio of Royal Albert Hall dates and after some pretty stringent security / ticketing checks, the team were able to take to their seats with a pair of 3D glasses waiting. 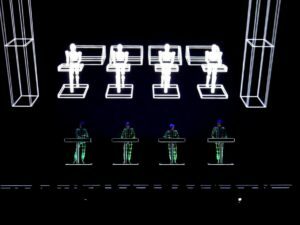 For those that have seen KRAFTWERK over the last few years, their stage set has been paired down extensively and no longer necessitates the band’s Kling Klang studio being carted around with them. Visually, they now rely on large back projections which have been transformed into a 3D experience. 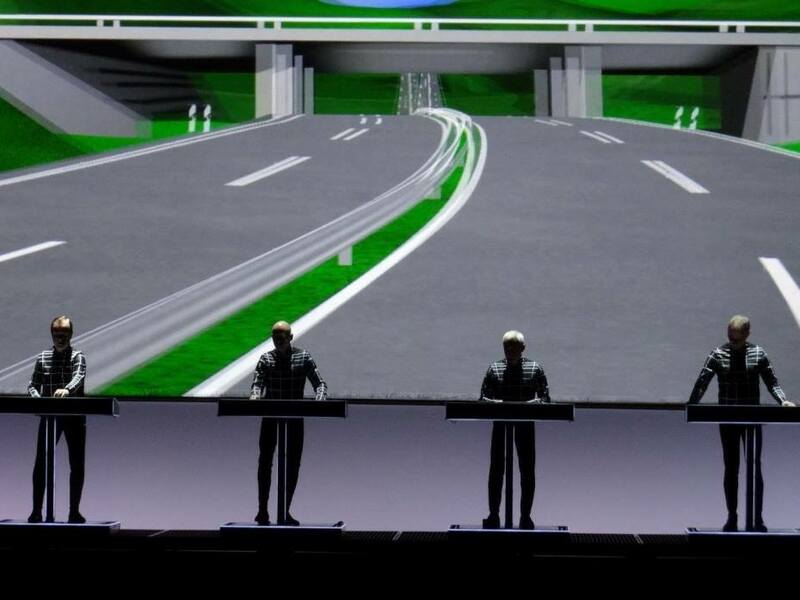 KRAFTWERK opened with a cluster of songs from the seminal ‘Computer World’ album, the traditional “Meine damen und herren…” vocoder intro introducing ‘Numbers’ which itself segued into ‘Computer World’ and then ‘It’s More Fun to Compute’ / ‘Home Computer’. Visuals from the ‘Minimum Maximum’ tour have been updated in places to maximise the effect of the 3D graphics and with a waveform pulsing in time with the intro, a version of ‘Computer Love’ rounded off the quintet of songs from this period. Seamlessly mixing elements from the original version and the one on ‘The Mix’, ‘Computer Love’ still remains one of the most beautifully melodic electronic pieces. 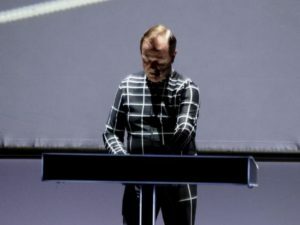 With Ralf Hütter playing the main melody part throughout, he was accompanied by an updated higher pitched vocoder adding in the ‘Computer Love’ robot voice. 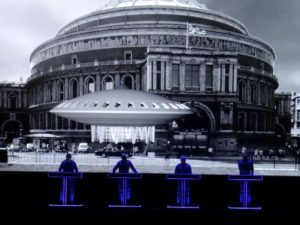 The next batch of songs that followed were from ‘The Man Machine’, the title track opened this segment of the show and was followed by ‘Spacelab’, which earned one of the biggest cheers of the evening when a rather comical ‘Mars Attacks!’ style spaceship flew over the Houses of Parliament and made a landing outside The Albert Hall on the screen behind. ‘The Model’ remained one of the few tracks in the set not to get extended or updated, such is this piece of electropop perfection; if something isn’t broken, why try to fix it? 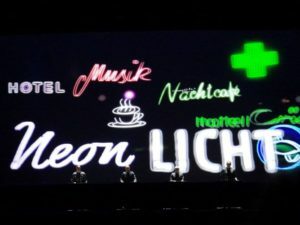 ‘Neon Lights’ which followed was also pretty faithful to the original album version with its sounds and structure. ‘Autobahn’ featured animated graphics inspired by the album cover, flipping between the Mercedes Benz and the Volkswagen Beetle in an interpretation which was an edited highlights version of the original 22 minute track. ‘Airwaves’ was given an interesting, almost GIORGIO MORODER-style overhaul, with its bassline taking much more prominence and THE BEACH BOYS elements being removed from the original. ‘Radioactivity’ still remains an absolute behemoth of a track, again incorporating elements from its original incarnation alongside the 4/4 kick of ‘The Mix’ re-work. 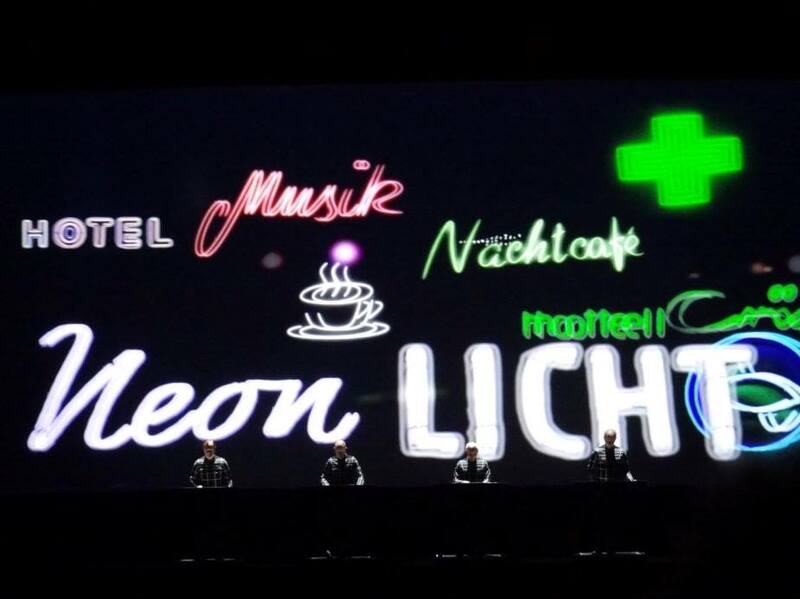 The track took the audience on a rollercoaster ride with visuals to match. 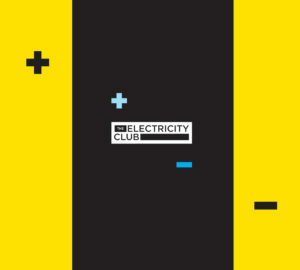 Probably the biggest surprise of the night was an outing for ‘Electric Cafe’ from the much maligned album of the same title, latterly rechristened ‘Technopop’ as part of ‘The Catalogue’ in 2009. 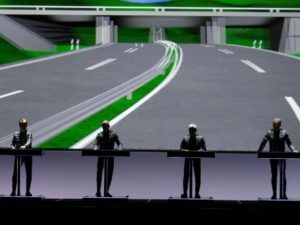 The song itself still sounds like an inferior version of ‘Trans Europe Express’, and was a reminder of the era when the band started to relinquish its influence and dominance over electronic music. ‘Tour de France’ was well represented with the original ‘Etape 1’ featured and then followed by a lengthy version of ‘Etape 2’. 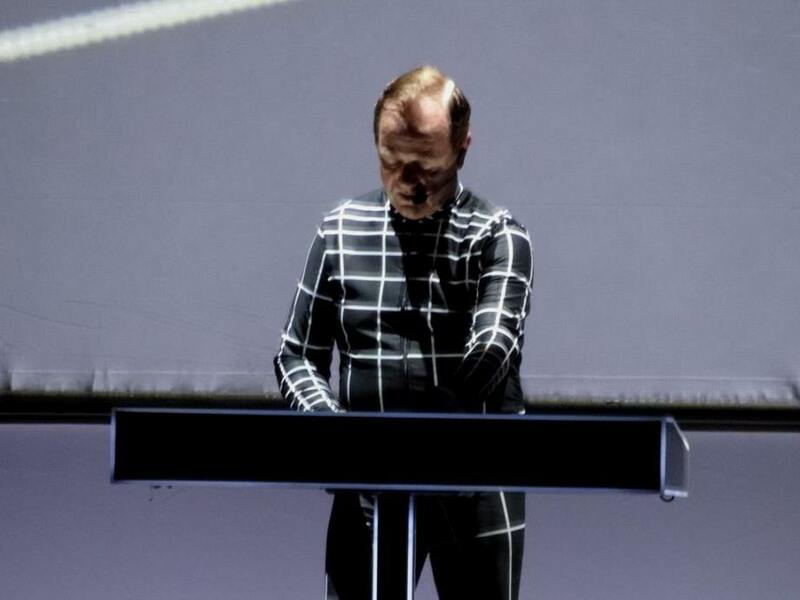 After ‘Trans Europe Express’ morphed into ‘Metal on Metal’ and ‘Abzug’ with its monochromatic train visuals, the band took a break, only to return in their robotic guise for ‘The Robots’; another updated track, this time with some updated synth sounds. 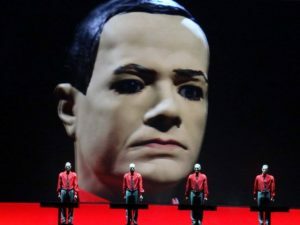 The robots themselves have transformed from the “legless” versions from the ‘Minimum Maximum’ tour and now look more like showroom dummies, which was probably the intention! A second encore followed ending with the customary ‘Boing Boom Tschak!’/ ’Technopop’ / ‘Musique Non Stop’ medley which allowed each member of the band to walk off and take their bow to the audience. Although predictably there was no new material tonight, it was refreshing to hear many of the tracks being re-werked and this at least showed the band weren’t content to completely rest on their laurels. It would be very easy to be cynical and criticise the way in which the band has spent the last few years pursuing ‘The Mix’-style updates of their songs rather than creating anything new, but at least the addition of the 3D element and willingness to experiment with the songs has shown that this isn’t just a blatant nostalgia-fest. What can’t be denied is how influential KRAFTWERK continue to be and tonight’s show demonstrated that they have one hell of a back catalogue and ably reminded the audience of the band’s lasting legacy.